The development of renewable energy since the early 2000s should continue and intensify in the coming years, changing significantly the electricity mix of the future while reducing the associated environmental impacts. It is therefore crucial to study the environmental impact of the different production sectors. The energy transition and, more specifically, the electricity mix of the future has sparked many debates about its environmental impacts, both on locally and globally. Direct emissions of greenhouse gases caused by the production of electricity and heat from fossil fuels alone account for 25% of global emissions in 2010. To fight against climate change while ensuring a sustainable energy supply, the European Union has set itself the goal of “3 x 20” for 2020: reduce greenhouse gas emissions by 20% compared to the 1990 level, reach 20% of energy savings and a 20% share in renewable energy (RE) in the European energy mix. Recently, the EU set even more ambitious targets for 2030 with 40% reduction in greenhouse gas emissions, 27% in energy savings and a 27% share of renewable energy. While some renewable energy systems have little or no impact during their operational phase, they nevertheless have an effect on the environment: upstream in the production chain, during the manufacturing phase, and downstream, at the end the system’s service life. To study the environmental impact of different production chains, we can use tools such as life-cycle assessment and other related indicators, such as energy payback time. The life-cycle assessment (LCA) examines the environmental impacts of a product or service throughout its life cycle. It is based on the compilation of measured environmental impacts at each stage, from the manufacturing of the components that form the system to the end of service life of the system itself. For example, in the case of the production of electricity by photovoltaic panels installed in France, the assessment will take into account the manufacturing of its polycrystalline cells in Asia, the mounting of its panels in Germany and its installation in France. LCA is takes into account an inventory of pollutants and the consumption of resources. This holistic approach, “from cradle to grave,” has undergone extensive standardization by the ISO (14040 and 14044 standards) and the European Commission. It is considered as a powerful supporting tool for decision-making and environmental optimization. Thanks to this type of analysis, direct and indirect impacts of energy production can be qualified and quantified according to various indicators. The impact categories assessed globally include global warming potential, human toxicity, acidification, primary energy consumption, but also the depletion of resources or anticipated shortages of mineral and fossil resources. This latter point should not be overlooked. For example, wind turbines depend on neodymium and dysprosium, two rare earth metals which act as permanent magnets in the alternator. These illustrate this sensitive issue of mineral resources: given the increase in the current demand, there will be a dysprosium shortage around 2020. Another example with very promising photovoltaic technologies such as CIGS (copper, indium, gallium, selenium) faces the same challenges: the “production reserves” ratio of indium is estimated to last only 20 years. The life-cycle analysis is based on various indicators. Among them, the “energy payback time” is a particularly appropriate indicator to quantity the environmental performance of renewable energy. These sectors are characterized by a major energy investment in the manufacturing phase but low energy consumption during the use phase. Energy payback time indicates the time required by a sector to produce a primary energy quantity equivalent to that which was necessary for its manufacturing. It is expressed in years and calculated based on the ratio of the energy consumed by the manufacturing of the system and the energy produced by the system over a year. The latter quantity is based on the primary energy necessary to produce the electric energy in the country where the renewable system is installed. This type of calculation is therefore specific to the electricity mix in the concerned country. 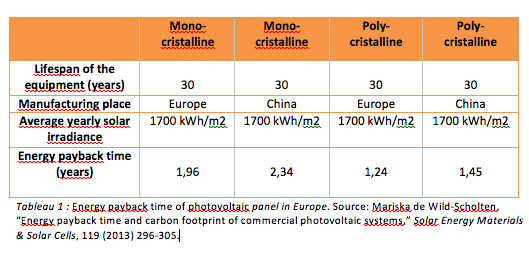 As an illustration, the following table provides the energy payback time for two solar photovoltaic panels with a peak power of 3kW (monocrystalline and polycrystalline technology) produced in Europe and China and installed in Europe. The geographical information is critical, because the return time depends on the energy content in kWh of the installation area. For Europe, the average electricity mix has a value of 11.4 MJ/kWh of primary energy per kWh of electricity produced. The return time would be higher for identical facilities located in countries where the energy mixes have a lower energy content. Life-cycle inventories of these systems are necessary to calculate the manufacturing of photovoltaic energy, covering all the sub-systems and the induced transportation. In this example, the life-cycle inventory values of these systems, manufactured in Europe or China, come from the Ecoinvent v2.2 database, based on the situation in 2011. The characterization of energy systems by life-cycle analysis and related return time indicators enables the comparison between channels and the identification of improvement solutions. It also feeds the technical and social debate around the expansion of renewables in the energy mix. In this perspective, the IPCC conducted a study in 2011 that compiles scientific articles on the carbon performance indicator. This indicator (in g of CO2-eq/kWh) compares the emission of greenhouse gases throughout the life cycle of the industry to the production of electricity. The aim of the study was to compare fossil energies (coal, gas and natural gas), nuclear energy and renewables. This compilation revealed the extent of the distribution of the results for each of the sectors, reflecting the great variability of local conditions and technological characteristics of systems in the available studies. It would therefore be unrealistic to try to identify each sector with a unique and absolute value of carbon performance. This overly simplistic interpretation would offer a partial view of the problem. The variation range of the carbon performance indicator highlights the best performance of renewables. This is a crucial point. But carbon is only one indicator among others. What about other environmental impacts, such as the depletion of natural resources or human health? The study is limited to the carbon performance indicator and would deserve to be extended to other indicators. To contribute to the debate on energy transition, these environmental assessments must be conducted properly i.e. by taking into account technological and local specificities. This will allow a comparison of power generation in energy mixes, as in the following example: Guadeloupe. The “Observation, Impacts, Energy” center of Mines ParisTech conducted a first life-cycle analysis on a regional scale, the EVALGTHDOM research project, to assess the environmental impact of prospective electric mixes for Guadeloupe. If the French authorities set an objective of 23% renewables in of the country’s electricity mix by 2020, for the Departments and Regions of Overseas, the goal is to reach 50% by the same date, and ultimately, a self-sufficient 100% by 2030. The choice of Guadeloupe is no coincidence. This volcanic island is a laboratory for geothermal energy: the central of Bouillante, the first geothermal electricity plant in France, boasts a capacity of 15 MW (photo BRGM).
. The baseline scenario used as a reference represents the state of Guadeloupe’s electricity mix in 2013, with 83% of fossil fuels, imported for the most part. It serves as a comparison with future scenarios and assesses the impacts related to energy planning decisions. Renewables account for 17% of the electricity mix.
. The trend scenario follows the trends observed in recent years in terms of energy demand without any special effort in terms of developing renewable energy or strengthening energy demand management (also known as “demand side management” or DSM).
. The PRERURE scenario reflects an increased effort to control consumption and promote the development of renewable sectors (up to 75% of the electricity mix). It is designed to promote the diversification of the energy mix. According to this scenario, geothermal energy is growing to reach a power of 85 MW in 2030.
. The moderate scenario, specifically established as part of the project, reflects a moderate effort to control consumption on the one hand and the development of renewables, on the other. The geothermal energy sector reaches a capacity of 45 MW. The different phases of the life cycle of the electrical system in Guadeloupe include the construction, production and transportation of energy. Impacts related to the final use of electricity are not included, nor the storage of electricity or processes of recycling and end-of-life. Inventories of energy conversion technologies have been compiled within the limits of specific details available for each technology.
. Acidification (the ability of substances to create and release H+ ions expressed in a SO2 sulfur dioxide equivalent) can have direct and indirect impacts on ecosystems (acid rain and soil leaching). This impact follows the same reduction scheme for the examined scenarios than the global warming potential.
. Ecotoxicity, expressed in CTUe (Comparative Toxic Units) is an estimate of the fraction of potentially affected species, integrated in time and space, per unit of chemical mass unit emitted. A decrease of the impact of the bagasse sector between the baseline scenario and the trend scenario, while its share in the power generation mix remains very similar (respectively 2.6% and 2.3%). This difference is due to the hypothesis of a decrease in the use of pesticides (complete stop in the use of diuron in three prospective scenarios, following its recent ban in Guadeloupe). Impacts are greater in moderate and PRERURE scenarios and are the direct consequence of the development of the cane and fibrous sugarcane industry for both scenarios.
. Marine eutrophication (in kg of nitrogen) is used to evaluate the potential for the eutrophication of the marine environment. Eutrophication is a process of accumulation of nutrients and can lead to problems (loss of diversity, degradation) in the affected environment. The study shows a strong decrease of this impact in all three scenarios. It is mainly due to the important efforts in mitigating the emissions of nitrogen oxides (NOx) and ammonium (NH4+) in thermal power plants equipped with a denitrification system that reduces the NOx emissions in fumes by 85%. Beyond its results, this study on life-cycle analysis of the energy mix at a regional scale participates in the debate on the implementation of the energy transition: it offers a first assessment of the impacts generated by each sector within this mix by pinpointing the sectors that have the greatest impact according to different selected indicators. LCA also reveals the contradictory trends of these choices on the different impacts and contributes to influence decision-makers in the Guadeloupe region. Based on these LCA studies, a sustainable energy development plan can be designed at regional scale: the optimization of local resources (whether renewable or not) to meet the energy demand; the control of import flows of fossil fuels, biomass or electricity; and of course, the mitigation of “environmental leakage,” such as carbon leakage. Will renewable energy sources soon be profitable? Wind turbine and solar power sources now represent a significant fraction in the electricity mix of industrialized countries. Shall they soon be profitable? Where does nuclear safety stand after Fukushima? The Fukushima has brought nuclear safety front-stage again. This catastrophe has already enabled us to pin-point several specific weak points, e.g., system complexity and non-collaboration (independence) of the Japanese institutions concerned.